Islands pepper the well known Venetian lagoon, but canals and rivulets divide within the city proper into islands as well. Venice set aside one of those islands, site of a copper foundry, as the Jewish quarter 501 years ago. I toured it in fascination during my rambles a few years ago; I went back the next day. The Venetian Ghetto was and continues to be a vibrant center of Jewish culture. The Ponte Vecchio Ghetto, once gated and locked at night. The multi-stories are a clue you are entering the ghetto. Though confined to their own quarter, Venetian Jews enjoyed relatively more freedom than they did in other parts of Europe—if being relieved from the threat of forced conversion (such as they faced in Rome or Spain in the 1500s) or pogroms (such as took place in Germany and elsewhere) can be considered freedom. The resulting influx of people swelled the population of that confined area from about 700 in 1516 when it began to several thousand a century later. 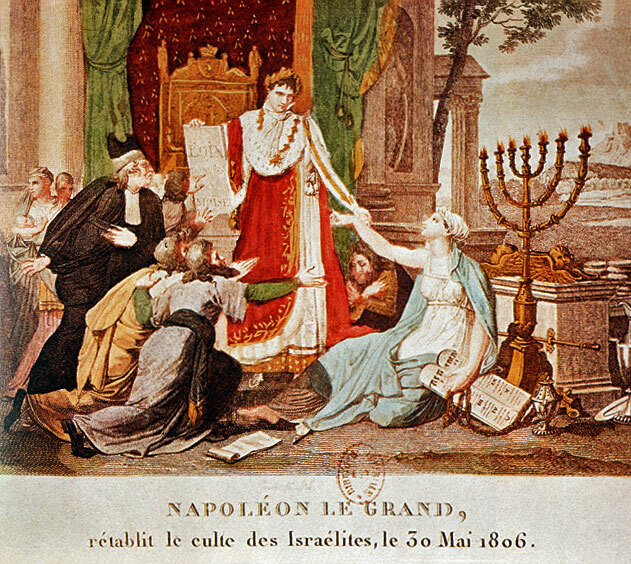 Jews from Germany, Spain, France, and the Ottoman Empire joined the original Italian population. The resulting cultural exchange unleashed a flowering of learning, publishing, and art unparalleled in Europe. This cultural outburst can be seen today in the five existing scola—their preferred designation for synagogues—in the ghetto, one for each of the main ethnic groups. You can visit them today, but don’t expect grand façades. Visitors are unlikely to identify more than one of them with the naked eye. 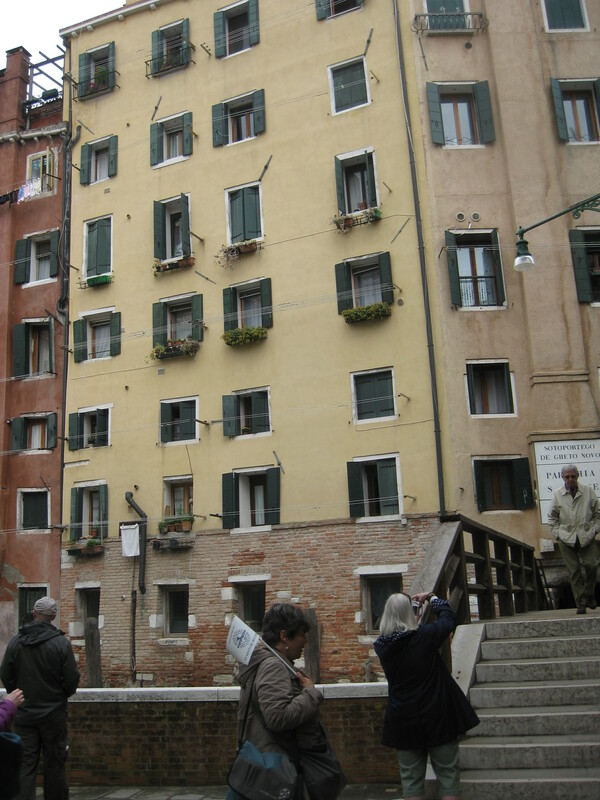 In the ghetto, lacking space, building tended to be upward resulting in some of the tallest buildings in Venice. The oldest synagogues are on second stories, as a result. It would be a mistake to assume them to be simple or plain, however. The residents built them with all the care a place of worship deserves, often hiring the same artists and architects that built the great churches such as Santa Maria della Salute. When the door opens you will want to gasp. (Photos of the interiors are rare. See link below) The Jewish Museum of Venice conducts tours of three of the synagogues. Freedom is, of course, relative. 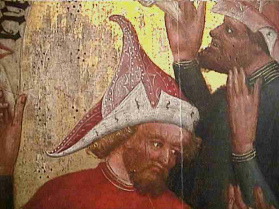 Venetian Jews were required to wear distinctive high pointed red or yellow hats to distinguish them from Christians as they were throughout Europe. They were confined to a narrow choice of professions, some menial such as cloth or fur selling. Money lending, forbidden to Christians, was crucial in the Venetian economy. (You may recall The Merchant of Venice) Jewish physicians held the position of highest esteem. Physicians were permitted to wear black hats. They could move about freely, but were all locked in at sunset. Many questions swirl around the ghetto’s history. Was it the first Jewish Ghetto, as is often said? 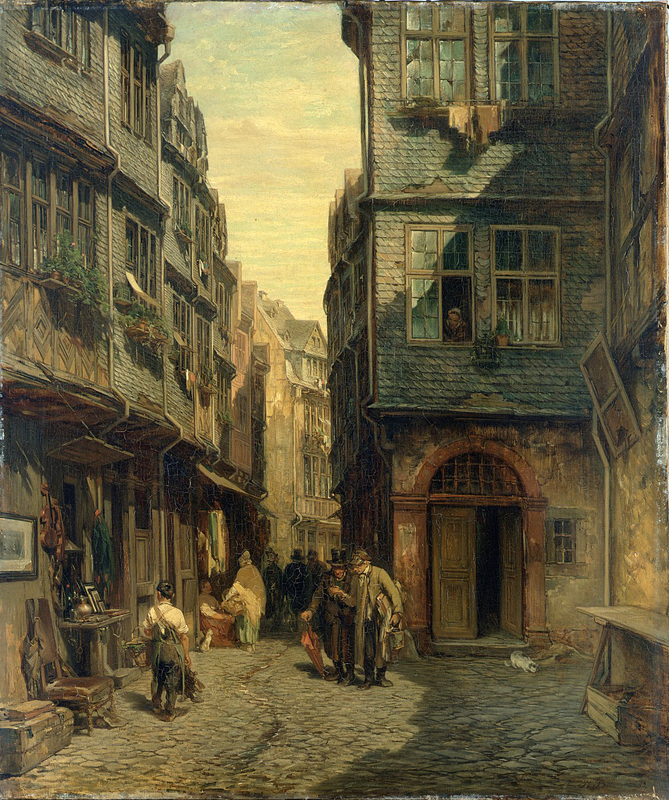 The Frankfurter Judengasse or “Jew’s Alley” in Frankfurt Germany predates it by at least fifty-five years. The Venetian one became the pattern for later ghettoes. Was Venice the source of the word ghetto? Many people believe so, but the etymology is unclear. The metal foundries and the copper foundry that existed there before the Jews arrived were known as the ghèto in Italian. Some other word origins have been suggested as well, however. Was its creation an act of persecution? Not initially. Venice pushed all foreigners into the nearby quarter. It is believed that Jews themselves asked for their own place. The bridges onto the island were gated. The gates were locked at night and opened at dawn. They may have served as much for protection as confinement. The residents were charged for the cost of guards and security. When were the gates removed? Napoleon took Venice in 1797 and he demanded that the gates come down almost immediately. Is the ghetto still a Jewish center? The entire population of Venice is in decline, with tourists greatly outnumbering the residents, and the Jewish quarter is no exception. Families may not live in the old ghetto, but many maintain membership in the synagogues and attend, some regularly, some annually, especially for high holy days. There are Jewish schools, bakeries, galleries, and shops to this day, and it is a place of pilgrimage for Jews world wide. If you visit, begin at the museum. Its collection is spectacular and you will want to book a tour. The result of her Venice ruminations, Lady Charlotte’s Christmas Vigil, about an English lady and an handsome Italian doctor, comes out this month. The hero’s esteemed colleague, Judah Ottolenghi, is a Jewish physician. Very interesting article! When I was in Venice, I was on tour with Texas Master Chorale, so sightseeing was limited. I would love to return on my own for a more in-depth visit such as you describe!! On my first trip we were given like three hours. THREE HOURS! When I got a chance to go back to spend a several days, I grabbed it. Interesting article. I have visited Venice more than a dozen times, and each time I discover something new and wonderful. Thank you! I feel the same way. Beneath the surface it is a complex place. Great article, as usual. I just love the lesser-known stuff you are able to find. 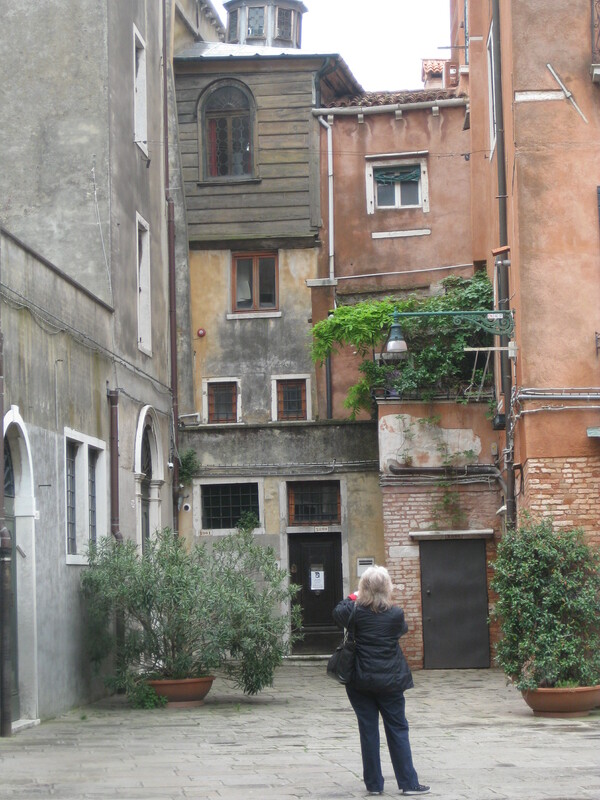 Thank you so much for sharing the history of this part of Venice. Excellent work. This helped broaden my world-culture knowledge base and that is always a wonderful thing. Thanks. That is a nice a compliment as you could give me. Your history blogs are always amazing. For me, my mother suffered the wrath of the Russian progrom, and has told me horror stories like when they would come killing Jews she would jump out the window and crotch down, or run to her uncles soap factory and hide in the barrels. She was only eleven when she came here. And her stories about her journey were also frightening. She told me that she had heard the streets here are made of gold. When she got off the ship she kissed the ground. Her childhood affected her whole life, and mine as well. Wow. That is certainly a story to tell! Thank you for the kind words. Lady Charlotte’s Christmas Vigil is set in Venice…travel always wakes up Caroline’s muse.